WARNING! A Study By A Top Health Expert reveals…..
…causing major concerns for staff health & safety! O.K…So who are we and what can you do to prevent this outbreak from occuring in your workplace? BlueResolve is a professional computer consulting company. We are the only company in the Triad that specializes in the technical cleaning of printers, copiers, fax machines, and other essential office equipment. We have successfully serviced the small office/home office market since 2003. We offer a basic service or a very comprehensive, preventive maintenance, and office equipment cleaning program for your business. Home Office Business Solutions offers an iron clad 100% Guarantee on all of our work…and we are the only computer cleaning company that we know of to offer such a Guarantee! Our Staff and Our Products! Why should you have your equipment professionally cleaned and sanitized? Home/Office will bundle your PC cleaning price by cleaning and sanitizing your entire workstation for just $15.00 per workstation (normally $35). Your equipments sparkle will be quickly restored. We also offer to disinfect the "human touch" areas, which will free these surfaces from bacteria and viruses. Because monitors produce a high level of static electricity they are very vulnerable to dust dirt and fingerprints. LCD and notebook monitors are professionally cleaned and sanitized with non-alcoholic ammonia free wipes specifically made for sensitive LCD monitors. Your keyboard collects a wide range of contaminants including food, dirt, and dust that make it one of the primary conduits of bacteria and viruses. The keyboard and connecting cable will be professionally cleaned and sanitized to remove any harmful bacteria to promote and maintain a healthy office environment. The mouse and connecting cable will be disassembled and cleaned to improve operation, efficiency, and to promote cleanliness. The keyboard and mouse are the “human touch” areas that require special attention to control the spread of dangerous germs and viruses. Your fax machine is one of your primary communication tools therefore we strongly urge period preventive maintenance for flawless transmissions. The glass cover and all exterior surfaces and controls are cleaned with an anti-static liquid as are the paper trays. Inferior quality of copies is caused by dirty rollers and excessive toner. Your printer is opened up and any loose toner dust is removed. All external surfaces, including crevices grills and paper trays are cleaned with anti-static liquid. (No solutions are sprayed directly onto the unit’s surface). The end result being a virtually brand new unit. Phones are the dirtiest piece of office equipment used today. They are a major source of germs with a risk of transmitting dangerous microbes. Phones should be cleaned frequently. The phone is first dusted then the surfaces are cleaned with a disinfecting wipe paying close attention to the ear and mouth pieces, grooves, crevices and around the number buttons. The unit is dried using a lint-free cloth removing all traces of dirt and moisture. 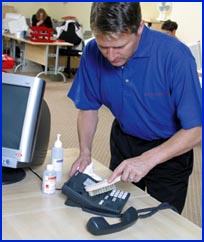 Call us at (336) 686-0582 and we will set up a time for a cleaning of your IT equipment.